When I think about the meals I’ve eaten in Greece, a few stand out. But none so much as a single grilled tentacle of octopus, served in a small, family-owned restaurant overlooking the sea on the remote island of Anafi. Seeing as that was eight years and a very long ferry ride ago — and my propensity toward motion sickness has increased exponentially over the years — I considered it a culinary memory that would always be cherished, but never repeated. 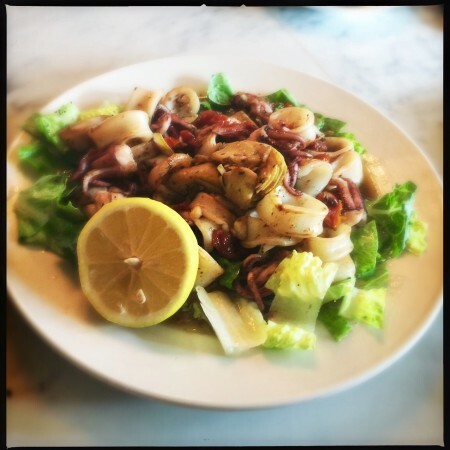 Granted, there’s no ocean view and a less-than-tranquil volume level, but the grilled octopus ($14) served at Stella’s on Saint Philip Street is a hell of lot cheaper than a plane ticket to Santorini and every bit as memorable. Think you don’t like octopus? Try again. Tender, sweet, and perfectly imbued with smoky wood notes, it’s an homage to the animal itself and — for lack of another word — phenomenal. Similarly, Stella’s calamari ($12) is not to be missed. Delicate, yet bold, the subdued flavors of the artichokes and sundried tomatoes balance the assertive char and caper notes. I have a marine biology degree, among others, and I have never wished harm upon a cephalopod in my life. But by golly, Stella’s skillful preparation of these creatures makes me want to eat them to extinction. I’m kidding. Let’s save a few, because how else can we keep eating them? Meanwhile, if you’ve spent time in Greece, you have no doubt learned there are a host of savory phyllo-wrapped pastries. In another authentic move, Stella’s offers three of the more common variations, filled with feta, beef, or spinach. The spanikopita ($10) does not disappoint, providing four flaky triangles crowded with fresh spinach and feta. An inherently rich combination of buttery pastry and salty cheese, it’s somehow light and fresh, notably elevated by the addition of mint. The saganaki ($9) is a visual showstopper and an excuse to pig out on cheese. 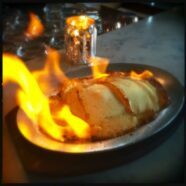 A colossal serving of mild, melty Kefalograviera is set aflame before you. 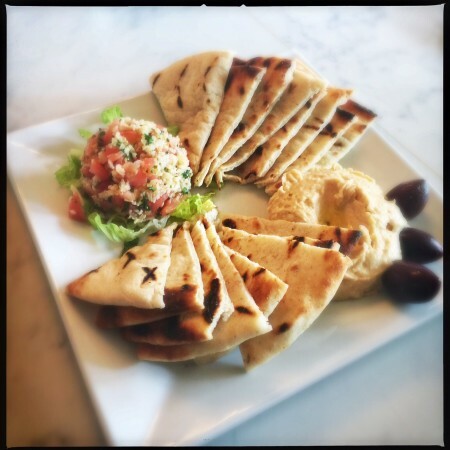 Once the spectacle dies down, dig into the crisp-around-the-edges feast with the accompanying fresh, grilled pita bread triangles. The combined flavors are comforting, reminiscent of an upscale grilled cheese. With two entire pages of small plates or meze, it’s easy to get into analysis paralysis. As a final flourish, I tried the marides ($10), fried smelts sometimes jokingly referred to as the French fries of Greece. Lightly battered, the powerful garlic notes of the traditional skordalia sauce help to balance some of the fishiness. However, note that this is maybe not first date material unless you’re looking for an easy way to avoid future engagements. Stella’s itself is vibrant and loud AF. Formerly the site of the Westendorff, the layout is largely unchanged. However, the previous decor has been upgraded and results in a vibe that is at once effortlessly sophisticated and undeniably hip. Be aware it’s ‘shout above the din at your dining companion’ loud, but that’s because it’s packed with people who seem to be genuinely enjoying themselves. And with friendly, efficient service and black-and-white movies playing on the brick wall in back, the noise is more fun party than cacophony. It’s the good kind of loud. The menu is sprawling, encompassing six pages chockablock with options. The Cypriot salad ($11) from the Salates section is made with arugula and a lemony vinaigrette. Topped with grilled halloumi cheese, pistachios, and green grapes, I anticipated the licorice-y shaved fennel to really make it pop, but sadly it was flavorless. All told, it’s a somewhat forgettable, inoffensive salad, but on a menu with so many standouts, probably not something I would order again. It’s hard to think of Greek food and not start craving lamb. 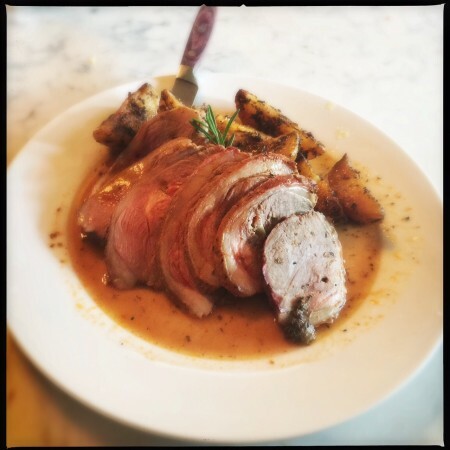 The leg of lamb ($18) is roasted with a clove of garlic in each slice. Beautifully tender and still a bit pink, it’s homey in such a way that you can imagine Stella herself serving it for Sunday dinner. Accompanied by roasted potatoes, you can also imagine that Stella must have really, really, really loved oregano. Coated with copious amounts of the herb on all sides, the flavor was just too pungent for me. Undeterred, I also tried the braised lamb shank ($21) with No. 5 noodles and brown butter shank sauce. It struck me that brown butter shank sauce is apparently the marinara of Greece. Served over the toothy noodles and made with a hint of cinnamon, the first couple bites may confuse your palate, but keep going. By the fifth mouthful, I started to wonder if I would ever make pasta sauce without cinnamon again. The giant shank arrives bone-in and the rich, tender meat marries beautifully with the comforting, flavorful noodles. 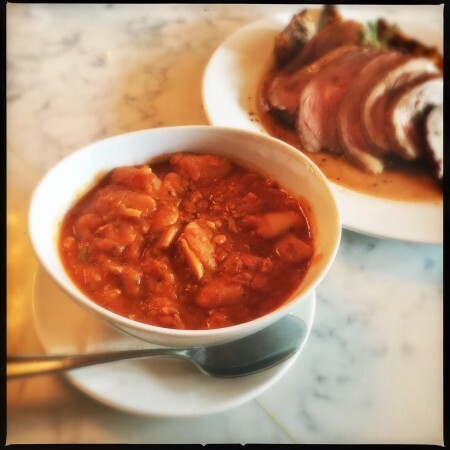 When eating at a restaurant for a review, I often find myself musing as to whether I might come back and spend my own time and money there in the future. Where Stella’s is concerned, the answer is just try and stop me.